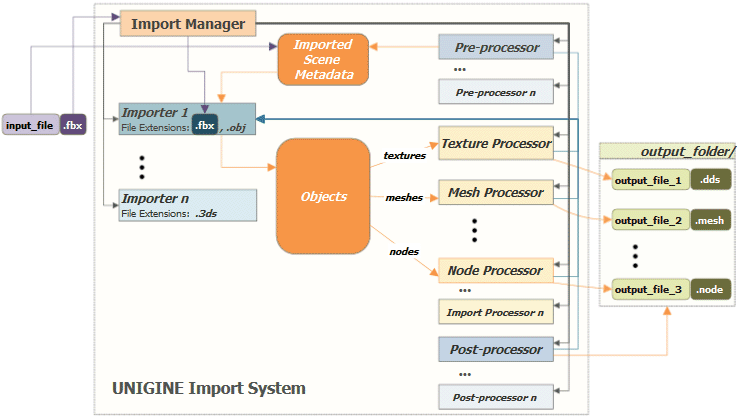 The Import System is utilized by both the Engine and the Editor. Out-of-the-box it currently offers an importer for FBX scenes implemented as FbxImport plugin, which apart from .fbx format also supports .obj, .dae, and .3ds. Custom importing modules (importers and processors) for any file format containing 3D scene data are also to be implemented as plugins. So, you can consider the FbxImport plugin as an example to build your own custom importing modules. You can also modify the plugin and rebuild it to use your own custom importer in the Editor.